[*] Description: Factorio Mod - Improves the enemies tactics by using potential fields/pheromones allowing probing of defenses, retreats, reinforcements, counterattacking, breaching, raids, rallying death cry, and player hunting. Uses nonhoming blockable biter projectiles. Adds new Enemies (disabled by default). Can completely replace the vanilla AI. Difficulty setting in mod options menu. - Difficulty Scaling - A mod option to control how quickly the ai can perform actions like making attack waves. - Recycling Biters - When large groups of biters form on the game map and aren't assigned to a unit group or near a base will be periodically removed and refunded to the ai causing attack waves proportional to the number of units removed. - Changed new enemy unit spawning probabilities to follow a gaussian distribution over the level of the nest, so lower level nest spawn lower level enemies longer. - Added a collision box reduction to all nests and worm turrets of 50% on the mod setting Enable the Swarm. - Integrated nocturnal mode with siege, migration, and raiding states so they work together now. - Swapped scoring function when in siege mode causing the biter lines to actually advance now. - Fix for biter getting 10x credits for destroying buildings causing relentless onslaughts. - Reworked dispersion to process pheromone in two phases. Last edited by Veden on Thu Apr 25, 2019 6:16 am, edited 145 times in total. TheSAguy: You noted future plans for tunnelers.. For some reason I'm just not the biggest fan of that. Maybe if I see it in action. But that got me thinking, you could implement the following. When the biters attack, some could bury themselves. This could give those biters very high resistances, thus keeping turret fire on them while others can get closer and attack. Or, if they flee they could bury themselves, thus becoming invisible till reinforcements arrive them emerge. Or Ambush the player. Surprise! I was thinking that the biters would be able to make a land bridge by filling tiles by using their bodies. I haven't attempted to make this yet though. The tunnelers would only be able to move one or two chunks worth of distance at most, so really they would only be able to breach a wall + turret layer at a time. The burying biters would have to trigger on entity death much like the retreat otherwise I don't know of a way to tell they are actually being attacked. TheSAguy: Okay, been playing for about 3 hours with this Mod installed. I'm playing with RSO and thus have to have many outposts. My biggest problem is keeping my outposts powered. I would have to agree, I have been making separate power grids at mining locations to combat the issue. Something like KS_Power gives a couple alternatives to water and coal importing. Oh, you've made it to the forums, I'd like to express my 'like' of this mod. Also, you probably should put crosslinks in a visible spot both here and on the portal. I played a little last night with NE+Rampant+RSO. There are two observations--the first is about Rampant and the other I'm not sure about. 1) The tactical retreat makes it too easy to fend off waves of aliens. Previously, waves would swarm your defenses, possible damaging or destroying walls and turrets. Now, after the first prolonged volley of fire, the aliens retreat. Very shortly, they will come back... a few die to the next volley and they retreat, ad infinitum, until they original wave is dead. This behavior also applies to turret pushing. 2) I like that aggressive action on my part (hunting bases) causes other nearby (and sometimes not so nearby) bases to send reinforcements. I was surprised when I was taking on a nest when a stream of aliens flanked me. After that I started paying attention to the minimap and I see reinforcements frequently coming to aid the nest. As for tunneling biters, I think that would turn defense into an exercise in frustration. Gameplay testing will tell the tale, ultimately, but that's my gut feeling. 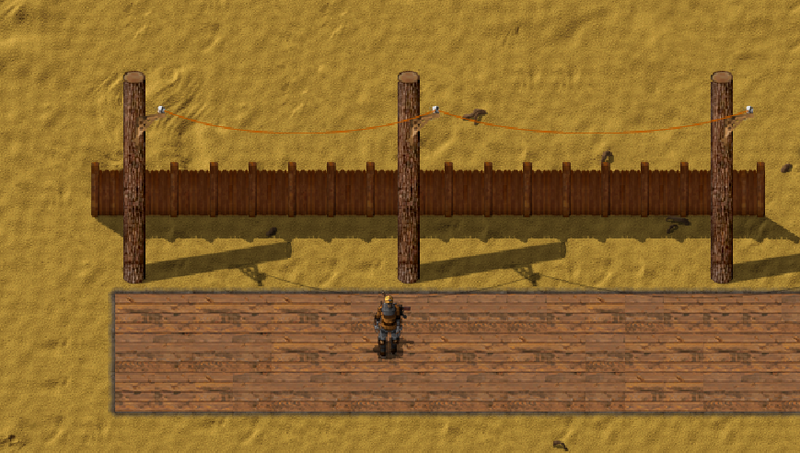 So after thinking about it, I'm going to make the Big Wooden Pole from Bio Industries act like the rail that regenerates. TheSAguy wrote: So after thinking about it, I'm going to make the Big Wooden Pole from Bio Industries act like the rail that regenerates. doktorstick wrote: I played a little last night with NE+Rampant+RSO. There are two observations--the first is about Rampant and the other I'm not sure about. What level was your evolution at? Veden wrote: What level was your evolution at? Unfortunately, I don't know. My evolution from the same game is now at 52%. Maybe it was around 20-30%? I haven't noticed that behavior as much anymore, but I'm also not paying attention as closely since my automated defense keeps things under control. As an aside, do you know if it is vanilla, NE, or your mod that triggers nest attacks when a tree is chopped down? I can predictably control waves of enemies by avoiding tree hacking. doktorstick wrote: As an aside, do you know if it is vanilla, NE, or your mod that triggers nest attacks when a tree is chopped down? I can predictably control waves of enemies by avoiding tree hacking. The retreating is based on the evolution level, so the higher it goes the more killing that is required. Here's a video at 54% evolution with the retreat oscillation. This happened about 15-20 times before I decided to record the video. Eventually they decided to attack but by then their numbers were thinned substantially (you can see the pile of bodies from the previous oscillations). That swarm attacked from the south. As you can see, I had wiped out a base so there was a lot of death in the area. The quality my not be too hot. I've never used vid.me before and I don't know how they scale 1080p captures. doktorstick wrote: Here's a video at 54% evolution with the retreat oscillation. This happened about 15-20 times before I decided to record the video. Eventually they decided to attack but by then their numbers were thinned substantially (you can see the pile of bodies from the previous oscillations). In my current game I have a group of probably 200+ that were scared of me after killing a few. I think you should have a threshold, if the group is a certain size, it gets harder for them to retreat. The threshold to retreat. OR maybe have a random kamikaze where they all out attack, to try an overwhelm one. TheSAguy wrote: In my current game I have a group of probably 200+ that were scared of me after killing a few. I do have some code in there for the kamikaze attacks, but it is triggering off a flat percent instead of scaling with group size or evolution. I will make that adjustment as well. This mod doesn't do anything. No retreat, no nothing. I have disabled all mods and created a new world. I would really like this to work but it doesn't. If I can help in any way please tell me. _ImPat wrote: This mod doesn't do anything. No retreat, no nothing. I have disabled all mods and created a new world. I would really like this to work but it doesn't. If I can help in any way please tell me. Seems to be something with your 0.0.5 version of the mod. I just updated factorio to 0.14.3 and installed your latest version of your mod from mods.factorio.com and it is fully working. You may want to take fixing the old mod into consideration. Thanks for this amazing mod! It seems you tackled it by making a new unit group and adding all the members back into that new group and issuing the order to the new group, yes? Please take a look at my discussions post on mods.factorio.com I explain what could be changed about the mod. As of right now, I don't enjoy a specific mechanic in your wonderful mod wich kind of ruins it for me. _ImPat wrote: Please take a look at my discussions post on mods.factorio.com I explain what could be changed about the mod. As of right now, I don't enjoy a specific mechanic in your wonderful mod wich kind of ruins it for me. Why not just discuss it here... Much easier than the portal.